That's me and Harold. Harold McGee, the guys who said that he's a writer more than a scientist, when my friend asked him what he considered himself to be. Harold, who wrote a Children's book on the science of ice-cream but had his book rejected by the publisher before he became THE Harold McGee. It's always a little inspiring to hear incredible writers talk about their early days. And then it's fun to hear them explain the science behind frozen berries, his new method of cooking pasta, and the gnocchi he had in a restaurant in NY that was made out of eggs and had eggs folded inside. He was at the edge of his seat trying to describe this dish and so perplexed that he could not figure out how in the world it was created. That first pic is Harold leaving a note and signing the book for you. You deserve it. I told him I had phenomenal readers. He said he did too. Having phenomenal readers makes our world go round so I appreciate you to the moon and back. I wish I could give each and every one of you an autographed copy of Keys to Good Cooking. Dang it. I so wish that could happen. Unfortunately, I only have one to give away. If you win consider yourself lucky, then go play the lotto. If you don't win put this book on your Holiday wish list. By what I can tell Santa Claus is a total foodie, I'm sure he'll deliver. and don't forget to enter your recipe for the cook off. To Enter: You have to be a Kitchen Corners follower. The follow button is in the bottom of the blog. If you're already a follower leave a comment saying hi. If you're a new follower leave a comment introducing yourself and if you have a blog and would like to leave your url please do so. I enjoy meeting my readers! Please make sure your comments link back to an e-mail address so I can contact you if you win. Giveaway closes: Midnight PST Thursday November 18th. The winner will be contacted via e-mail and announced next Friday. post-edit: Guess who won? Beckster's Laboratory! Go check out her blog for yummy recipes. That looks like a great book! I am a follower! 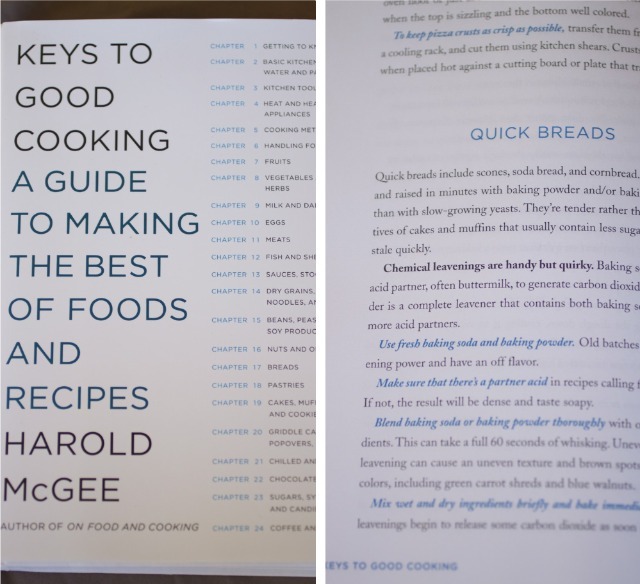 I am a gfc follower, I would love this cookbook. Very cool book, I am a follower and would love this on my Xmas list. me? phenomenal? i guess i am. I'm a follower and I just liked you on Facebook. Great looking book. Always interesting to read about the science of food. I'm already a GFC follower...hi! Thanks for the chance. Oooh, I love this! I'm a follower. Obviously. Am a follower... what a great book for a giveaway! I love the scientific angle to cooking; it intrigues me!! I think Danny would like this book. This looks like a great book. Thanks for having a giveaway! Subscribed for your emails! I did everything haha i want to win! :) So wish I could have met him in person too! Cheers to getting an autographed copy of his book!!! So lucky, that you had the opportunity to meet Harold in person. That book sounds like a must have for every home chef! What a great giveaway!! It was so nice meeting you in person at the Foodbuzz festival! I am getting this book; I need this book in my life. Wow! How cool that you went to this signing! I remember hearing that he'd be in Nor Cal but the date totally slipped past me, obviously. I love On Food and Cooking... it was one of the first books that really inspired me to learn the science behind cooking. I also follow on facebook...oh what was life like before facebook. Thanks for stopping by my blog. Sounds like a good giveaway you have going on. I am now following your blog. Thanks again for your comment. Thanks for stopping by blog. I love this giveaway! Count me in. And now I am a follower on your facebook too. Thanks again, for this great giveaway! Congrats on getting an autographed copy of his increible book! I've done all of the above. Count me in and my fingers are crossed! oba! looks like a must have! I also follow your RSS through Google reader! I am now officially following you. I would love to win this book. I'm a huge "foodie," and am currently knee deep in Amanda Hesser's new cookbook, The Essential New York Times Cookbook. In fact, I'll be giving her book away on my blog next week, so come visit! You're so lucky you met Harold McGee. I am a Google follower. This looks like an excellent book. Hi, new subscriber - Tonya Dean. I am a horrible cook and I could use anything that might help me! Thanks for the chance. Im a new follower, My names Melanie and Im newly learning to cook! new subscriber --I'm a baker and a struggling cook I have an aversion to cooking meat and need all the help I can get. hi I'm a new follower! I am a new follower. I don't have a blog, but I love to cook.